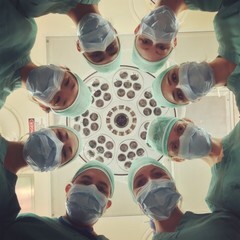 Dr. Stephanie Goff of NCI’s Center for Cancer Research (CCR) poses with seven female clinical fellows in an operating room at the NIH Clinical Center in Bethesda, Maryland. Dr. Goff shares responsibility for the care and management of patients receiving cell-based immunotherapy for the treatment of metastatic solid tumors on protocols established by CCR’s Surgery Branch. Also in the photo are Drs. Sadia Ilyas, Meghan Good, Parisa Malekzadeh, Kaitlin McLoughlin, Stacey Doran, Christine Kariya, and Winnie Lo.